More details can be found here or by clicking on the picture above. PLEASE NOTE: Pieter does not speak English and will most likely not be responding to questions in this thread. or use the button to the right. Last edited by Skipper; 02/05/2006 at 09:40 AM. As I cannot edit my own posts: Pieter does READ English, but indeed I'm afraid he would most likely not respond to questions. I'll try to do my best and answer some every now and then. I don't know the tank that well, but I have seen it in person a few times. 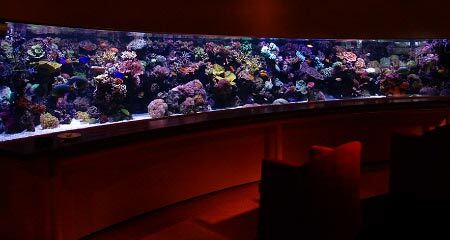 No offense to previous winners or anyone with a reef, but that tank should be tank of the month every month! AWESOME! A very very impressive tank and setup. That tank of the month is THE SIC - EST thing I've ever seen. I've never seen a tank so cool. I'd love to see a fish only set up like that. What do you do for a living? You must be a millionaire, no doubt. You have been weighed... You have been measured... YOU have been found wanting! Gelukwensen! Zeer mooi! Een welk verbazend aquarium; dank voor het delen. That is a beautiful and unique tank!! HOLY $HIT, first words out of my and the wife's mouth! Never in my life have I see anything as nice as that, not even in aquariums. As close to the wild as you can get without getting wet. Everything is INSANE!!! No words can explain how beautiful your tank is! Congrats Pieter! Current Tank Info: 600G system in the remaking, back to square one, learning in process! That is an amazing tank, truly a vision and an incredible feat you have accomplished that is beyond words. This is the most beautiful tank I have seen ever. This is getting scary, the overseas tanks are starting to put us Americans to shame. I especially like the length of this tank..... most people who starting getting this big make their tanks too tall and deep instead of using length. I can not come up with words to describe what I'm feeling after seeing that tank, so I wont. The only downsides with that tank is 1) its almost impossible to get a good picture of the whole thing because its so big! that is absoutly amazing! Very beautiful! any pics of the seahorse tank? Ik ben ademloos. Dit is een ongelofelijke tank. Ik denk dat het goeder is dan de tanks die ik aan de Chicago heb gezien aquarium Shedd. Bovendien beter dan de tanks aan de tanks aan het Texas Staatsaquarium in Corpus Christi. Ik denk dat het de mooiste tank is die ik gezien heb. Ik zou zeggen, uw doel is ontmoet worden. Ik gebruikte een vrije translater. Ik hoop dat het begrijpelijk is. I am breathless. This is an unbelievable tank. I think it is better than the tanks I have seen at the Chicago Shedd aquarium and the tanks at the Texas State Aquarium in Corpus Christi. I think it is the most beautiful tank I have seen. I would say, your goal has been met. I used a free translater, I hope it is understandable. The best way to keep fish? Is in a frying pan, lightly breaded and seasoned with a little salt! Current Tank Info: No Tank! Very very nice, to say the least!! I guess it was only a matter of time before it appeared here. A BEAUTIFUL tank, and all the effort that goes into it deserves 3 big thumbs up! Seriously, what can you say? I just finished my weekely water change on my 50 gal uniquarium. I can't even imagine having that tank. beautifuly, absolutely beautiful. I love the chairs/seating area. that is my dream. who needs a big Plasma tv. not to mention the incredible corals, fish, equipment. That tank must take true dedication to keep it looking great...Keep it up! My congratulations from Panama (Central America) imagine yr tanks is 10 times bigger than mine. I am very impressed with yr aquarium , absolutely beautiful !!! Current Tank Info: 60''L x 24''W x 27''H with a 75 glns sump with no sand nor caulerpa only water but containing: phosphate removal reactor, carbon reactor, biopelets chamber. Have installed P. Skimmer Octopus Super Reef EXT5000 , Chiller 1HP.